With the interest rate markets pricing in no hikes for 2019, there was room for the FOMC to disappoint at its January meeting; however, they ended up surpassing the most dovish of expectations. As a result, risk assets rallied sharply in January as global central banks followed in the Fed’s footsteps in easing financial conditions. In his statements, Chairman Powell signaled that the case for additional rate hikes had weakened and declined to rule out that the next move in rates would be lower. Most importantly, the Fed said that it was prepared to adjust its balance sheet normalization to economic and financial developments. Basically, if raising rates or lowering the size of the Fed’s balance sheet turns out to negatively affect markets, Powell and the FOMC would adjust policy as necessary. Thus resumes the cycle of central bank policy acting in response to financial markets. The chart below shows the 12-month forward federal funds rate compared to the S&P 500. 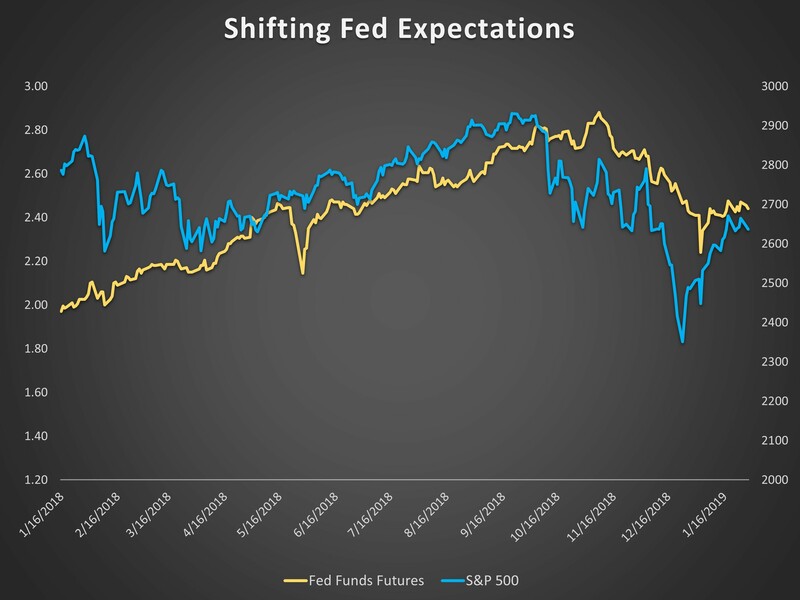 Expectations of Fed policy have traded in lockstep with the equity markets. Given our focus on balance sheet policy as a source of risk asset fragility, this action removes a major point of uncertainty for financial markets over the next few months. We’re still wary of a material slowing in the global economy, but as of this week – it doesn’t look like central banks will be part of the problem.